Warner Bros., if you're reading this, Ondrej Tokar would really like to talk to you. It's a little bit complicated," Ondrej Tokar says with a laugh. Tokar is the creator of Maguss, an augmented reality mobile game that transforms players into wizards wandering around a world of spells, potions, duels and fantastical creatures. But let's get one thing absolutely clear: It's not a Harry Potter game. Tokar has to emphasize this fact because his team has already been contacted by someone claiming to represent the Harry Potter brand, asking them to distance Maguss from J. K. Rowling's world, or else. Strangely enough, this is precisely what Tokar wants. Tokar's dream is to create the Harry Potter Go game that fans have been clamoring for since Pokémon Go busted down the doors of the mainstream, mobile AR experience. Maguss has been in development for two years, and it currently occupies an original world of magic. Much like Pokémon Go, it features digital creatures to find scattered around real-world maps, plus it has quests, crafting, the ability to duel other players, factions to join, spells to learn, potions to make and ingredients to hunt down. And the team is building an actual wand peripheral that connects to the app via Bluetooth, allowing players to flick and swish just like they've always dreamed of. Though Maguss is already far along in the development process, Pokémon Go's success in July presented fresh marketing opportunities. Tokar and his crew began positioning Maguss as the Harry Potter Go solution that many fans wanted. They branded its social media posts with things like "#HarryPotterGo" and "#Potterheads," and even wished J. K. Rowling and Harry Potter a happy birthday alongside Maguss tags. They knew they were walking a fine legal line. They were careful to never say Maguss was an official Harry Potter game, while still blatantly marketing the idea to Harry Potter fans. This wasn't just a way to get more people excited about the game: Tokar wanted to get Warner Bros.' attention, even if it came in the form of a cease-and-desist. "We think there's a huge market for it and we also think that we went quite far to get to the point that we are now, and we're not far from launching," Tokar says. "We just need Warner Bros.' permission to make it Harry Potter themed." Maguss developers did hear from someone claiming to represent Warner Bros., but it arrived in an unlikely form: a Twitter direct message. The DM came from the @HarryPotter_UK account, whose bio says, "The Harry Potter Film Twitter feed for United Kingdom." It reads like an official account might, though it isn't verified. Tokar isn't sure if the person who contacted him is truly a legal representative for the Harry Potter brand. They moved the conversation from Twitter to email, where Tokar explained the situation: He wasn't selling Maguss as an official Harry Potter app, but he would love to talk with Warner Bros. about a potential partnership. This is where things turned fishy for Tokar. The representative refused to identify herself, and at one point she told Tokar that he would never have the rights to a Harry Potter game. This set off alarm bells in his head: He questioned whether she had the power to make that claim for the entire Harry Potter ecosystem. Once Tokar raised concerns about her legitimacy as a legal representative, she stopped responding entirely. But, to be safe, the Maguss team notified fans that it had to stop mentioning Harry Potter altogether, and it added a disclaimer on its website. "We did all the precautions to be safe, but we are not sure if that is the person that is really legal," Tokar says. Engadget has reached out to Warner Bros. Interactive Entertainment about its stance on third-party developers and whether it would be open to working with a project like Maguss. We'll update this story if and when we hear back. Maguss has been in development for two years. Meaning: It isn't a knee-jerk reaction to Pokémon Go's success or the recent online movement calling for a Harry Potter version. It's a passion project for Tokar, who's a huge Harry Potter fan in his own right. In 2014, his girlfriend surprised him with a Harry Potter–themed trip around the United Kingdom for his birthday. They visited the studios in Leavesden where the films were produced and rode the Jacobite steam train -- or, as fans know it, the Hogwarts Express. During this trip Tokar, a developer by day, imagined how he could bring this magical world to life. The wand seemed like a good starting point, and pairing that with a mobile AR game made the most sense. Tokar, based in Denmark, teamed up with a colleague from Portugal and they got to work on Maguss, a game steeped in magic and fantasy but completely separate from the Harry Potter brand -- or any other fictional wizarding world, for that matter. They launched a Kickstarter campaign in August 2015 that featured a wand peripheral powered by a motion sensor and IR LED, which connected to a receiver shaped like a coat of arms that players attached to their clothes. The receiver then transmitted players' movement data to a smartphone. It was an inelegant system -- and likely one reason that the Kickstarter didn't get funded. Tokar raised roughly $24,500 of a requested $53,000. "And we know why," Tokar says. "It just wasn't high-quality enough. We know it. And right now, I think we are proving that it's much, much better." Today, Tokar has a full team of artists, developers and marketing professionals helping to build a new and improved version of Maguss. The wand uses Bluetooth, negating the cumbersome coat-of-arms receiver, and the interface looks better overall. Players don't have to use the wand either, and can instead trace spell glyphs right on their phone's screen. "That is to target people that are shy to run around swishing their wands, or for people that want to play the game somewhere in public or in public transport, for example," Tokar says. Plus, with Pokémon Go's success this year, the project is a much easier sell. However, this level of awareness also has a downside. Pokémon Go has made mobile AR games more viable in the public eye, but that means other companies are ready to pounce on this fresh industry. A Russian company making a magic-themed mobile AR game already tried to poach one of Tokar's artists in the past few months. "Fortunately he told me," Tokar says. And then there's Warner Bros. itself. What if that company, with all of its funding, access and legal rights, decides to develop its own Harry Potter Go? "I have invested lots of money into this project, lots of time," Tokar says. "On one hand, I would be very happy to see a game like that. On the other hand, we would be happy to be the ones developing the game." Maguss is roughly halfway complete. Tokar plans to launch another Kickstarter campaign in mid-September, hoping to raise enough money so his team can finish it off. Right now, he's funding the development on his own. "It's quite rough, but it's working out well now," he says. There's a mountain of land mines in front of Maguss, from legal concerns to copycats to official designs, but Tokar isn't giving up. 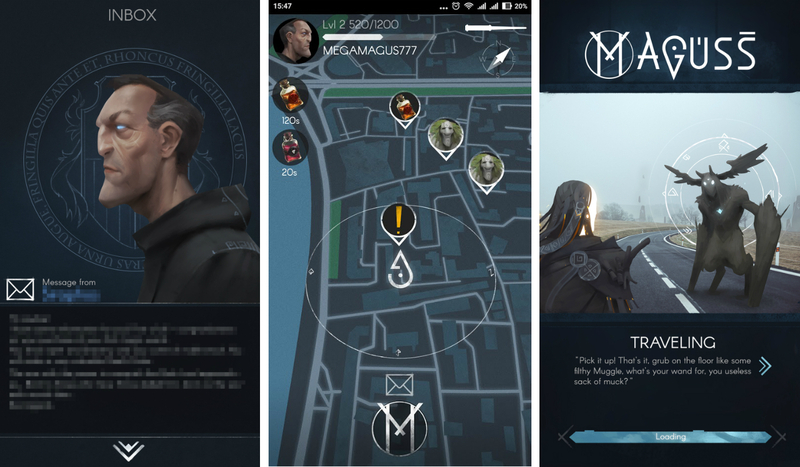 He still hopes to get in touch with Warner Bros. and talk about turning Maguss into an official Harry Potter Go app, whether that contact comes through the Kickstarter, Twitter, Facebook or articles like this one. Or, perhaps, by magic. "We would still like to speak with Warner Bros. to make it Harry Potter themed, but we are going our own way right now," Tokar says. "But still, if we have the opportunity, we will take it."